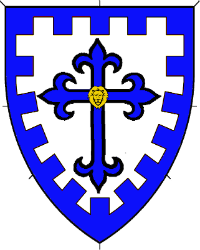 Argent, on a Latin cross flory azure a lion's head cabossed Or, a bordure embattled azure. Name registered with the College of Arms in May 2017. Device registered with the College of Arms in May 2017. Device image courtesy of Etienne Le Mons.